The history of the Venice Carnival dates back to the 17th century, right after the victory of the Republic of Venice against the Patriarch of Aquileia. In the 18th century, the Carnival of Venice became a symbol of Venetian culture, and a way to show the Republic’s prestige and power. In the life of Venetians, Carnival was a moment when they could be anyone they wanted to be, with no differences between social classes. The Venice Carnival represented a period of total freedom; this was the main reason why people from all over Europe came to Venice, to taste and experience the freedom they had heard about. Venice Carnival was indeed a time where everyone could be whoever they wanted to be. However, back in the 18th century, there were only two masks people could wear, the so-called “Bauta” and the “Moretta”. The Bauta is a white mask that covers the entire face, with a prominent nose, two holes for the eyes, and no mouth. It is usually worn with a black “tabarro”, a long cloak that was initially worn to stay warm, since Carnival takes place in winter, and then became part of the whole costume. 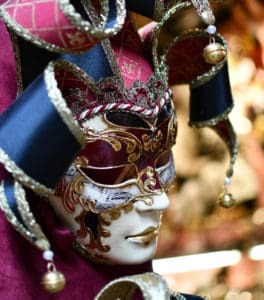 Another typical mask was the so-called “Moretta”, which means “dark mask”, but if you want to know more about it, we recommend reading our blog post about Venice Carnival history. Nowadays, there isn’t a typical Venetian mask anymore. You can wear anything you like, and spend a day around the streets of Venice being whoever you want to be. You can also participate in the annual best costume contest, and try to win the first prize! Besides the contest for best costume, there are a lot of things to do and events to attend during Carnival. To live the Carnival of Venice as Venetians used to in the past, you could think about attending a dinner & ball event, wearing an 18th-century costume and dancing beneath a frescoed ceiling inside an ancient Venetian palace. You can also do a bacaro tour wearing your costume, pretending to live in a different historical period for a day. Moreover, don’t forget to taste “frittella”, a traditional kind of fried doughnut, that you can only find during Carnival. When is Carnival in Venice? The Venice Carnival dates change every year, depending on when Easter will be. In 2019, Carnival will take place from February 16th to March 5th and, of course, there will be many parties and exciting initiatives like masked balls. There are also some not-to-be-missed events during Carnival, such as the traditional “Festa delle Marie”, a parade of twelve girls called “Marie”, which evokes an important annual event Venetians used to celebrate in the past. Another event that shouldn’t be missed is the ‘Flight of the Angel’, on Shrove Thursday, which has its roots in a fact that happened many centuries ago in Venice. A Turkish acrobat, to pay homage to the Doge and astonish the Venetian people, decided to walk on a rope from a boat moored along Riva degli Schiavoni to the top of the St. Mark’s bell tower, and then from there to the roof of the Doge’s palace. Unfortunately, he fell and died, and because of that, the event was called “Flight of the Turk” for a while – until its name was changed to ‘Flight of the Angel’. Follow the Venice Carnival official website to find out all there is to know about parties and events!